In 1977 Srila Prabhupada departed, leaving us with a poignant final lesson: how to leave this mortal world. A Vaishnava poet has written that no one can fully understand the words, activities, and characteristics of a pure devotee. Nonetheless, let us try to appreciate some of the pastimes of Srila Prabhupada in the final months preceding his acceptance of samadhi. 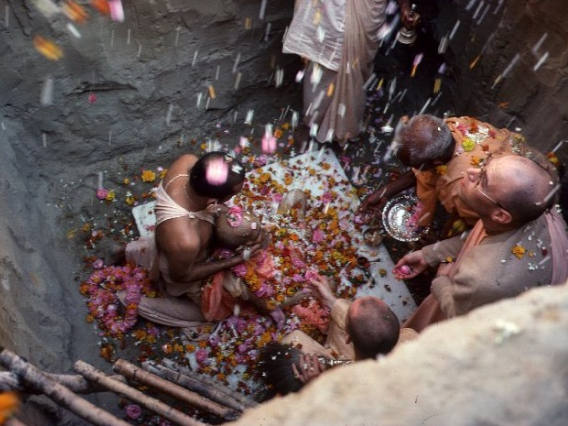 One special feature of Srila Prabhupada's activities is his relating intimately to the human condition while at the same time remaining aloof and transcendental. As a pure devotee, he was not subjected to the law of karma, which awards reactions for pious and sinful deeds. He was not born by the force of karma, nor would he die by force of karma. As stated by Srila Rupa Gosvami, "One whose body, mind, and words are fully engaged in devotional service to Lord Krishna is a liberated soul, even while living in this world." People often misunderstand the movements of a pure devotee within the material world, just as one, on seeing clouds blowing past the moon, may think the moon itself is moving. The shastra, therefore, warns us never to see the guru as an ordinary man subject to karma. But Srila Prabhupada, while always transcendental to this world, showed the conditioned souls how they too could come to the stage of liberation by constantly thinking about Krishna and serving Him, so that at the time of death they could return to Krishna in the eternal, spiritual world. And PrabhupÃ¤da's lessons were always practical and universal. Srila Prabhupada's books, for example, were not mere theory but were practical and full of realized knowledge. And PrabhupÃ¤da practiced what he preached; his entire life was exemplary. He had been in family life, and even then he had vigorously preached, by starting his Back to Godhead magazine. In poverty and obscurity he had struggled to start a spiritual movement, and by the grace of Krishna and his spiritual master, he had become successful. He had always shown by his humanlike attempts his willingness to bravely take on austerity and face danger. He had shown exemplary spiritual life for all to try and follow. He had gone alone, in old age, to a foreign country and had chanted Hare Krishna in a park in New York City, attracting the young men and women of America. Therefore everyone should take his example and try to serve Krishna, despite the immediate impediments. Srila Prabhupada encountered obstacles, yet by his free will and the help of Krishna, he surmounted them. This was his wonderful example. It is said that Lord Chaitanya, five hundred years ago, made surrender to Krishna more attainable than Lord Krishna had five thousand years ago. And now, in the twentieth century, Srila Prabhupada has made Krishna consciousness possible for people all over the world. As part of his instruction and example, Srila Prabhupada knew he would have to show people just how to die. He had escaped death a number of times-by Krishna's grace, by the prayers of his disciples, and by his own pure and powerful will to propagate his movement. But from the signs given to him by Lord Krishna in 1977, Srila Prabhupada began decisively and conclusively ending his mission in the material world. And among his final duties was his giving complete guidelines on how to die. He was perfectly showing how to do that which everyone has to do, but which is most difficult to do successfully: die.